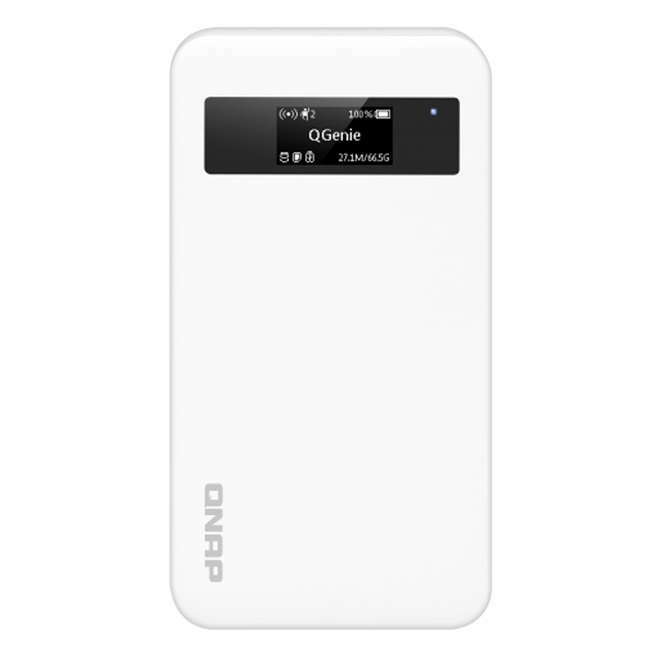 The QNAP QGenie 7-in-1 Mobile NAS (QG-103N) is a prime example of how far mobile technology has come in recent years. This mobile device allows you to transfer files from your phone or tablet using the myQNAPcloud service as well as Qfile, Qsync, and much more. There is no doubt that this can be an extremely useful device for those who travel for work or go on vacation and need the additional space to store anything from photos to important business files. The ability to wirelessly transfer files from a mobile device such as a phone or tablet to an NAS can be a great and highly convenient thing, especially for those who travel a lot. Interested about QNAP QGenie QG-103N? See more reviews and latest price from Amazon. The first thing that most people who purchase this mobile NAS will notice is its size. Those who are always on the go will be happy to know that this mini server is small enough to fit into most pockets, so you can travel with it comfortably. QGenie is designed to allow for up to 20 different users and simultaneous file access for a maximum of 8 users. This mobile NAS is also designed to work as a satellite device, allowing those who use it to copy files from the Turbo NAS to the QGenie QG-103N with a one-touch copy function. This makes accessing and managing content on your QGenie easier than ever when you are traveling outside. QGenie (QG-103N) is an interesting device. It’s small, it has a fast storage (SSD) and… a battery. QGenie QG-103N is device is unique among NAS devices. Activating this mobile NAS is just as easy as pushing its slide switch, opening up a whole world of possibilities when it comes to accessing, managing, and sharing a variety of files via a Wi-Fi SSID that is completely unique to the device. Because this NAS is so small, it allows users to take it anywhere they want by sliding it into their pocket. You will be able to access and enjoy the files in your collection by using the Qfile mobile app. Multimedia access is supported for up to 8 different devices with this NAS, allowing users to share numerous types of files back and forth. This particular feature is ideal for those who are traveling in a vehicle, whether it is a vacation or just a small road trip. This NAS allow allows users to stream music from their phone to their car stereo via Bluetooth. Those who purchase this mobile NAS will find that they can quickly and easily share files when getting together with friends or family, which is definitely one of the more convenient things about this device. QGenie QG-103N is compatible with Windows, Mac, iOS, and Android devices. The personal cloud makes accessing files easier than ever, no matter where you are. There is also a phonebook backup so you will never again have to worry about losing all of your contacts. The Qfile mobile app allows users to back up and retrieve any of their phonebooks from an Android or iOS device so that no crucial data is ever lost. Those who get a new phone will find that they never again have to worry about manually entering in all of the names and numbers for their contacts, as it can be transferred directly from the QGenie to save a lot of time. This device uses USB 3.0 SSD, making files transfers extremely fast. The Qfile mobile app allows users to create their own personal cloud for saving, accessing, syncing, and sharing any files they want, provided they are stored on the QGenie. The QNAP QGenie has a fairly impressive 600MHz CPU as well as one USB 3.0 port, a LAN port, and a 3000mAh built-in battery. This mobile NAS has SD card support as well as a 32GB SSD. This mobile NAS has an OLED display which shows the current system status, including the total and current storage capacity as well as battery power and wireless connections. The SD card slot on this mobile NAS is perfect for professional photographers and others who quickly run out of storage space while they are away from home and working. Even though the port amount is minimal, it actually fits the purpose perfectly. 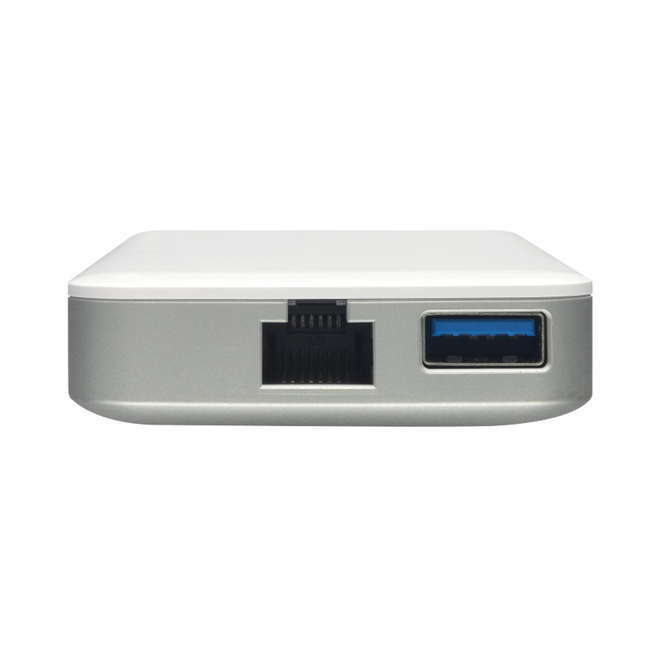 This NAS also provides users with a wireless access point for connecting multiple devices to the internet via a Wi-Fi connection or hardwired connection as well as smartphone hotspot and LTE/4G/3G dongle. Those who use a Wi-Fi hotspot will find that their internet signal will be significantly stronger than any other type of connection and the NAS will charge the smartphone simultaneously so you won’t have to worry about draining the battery. The overall performance of the QNAP QGenie 7-in-1 mobile NAS is perhaps not quite as impressive as some would like, but it is definitely adequate when it comes to satisfying the needs of most of its users. When this NAS is connected to a computer, it turns into a high-performance SSD that can read files at a speed of 120MB/s and write files at 40MB/s (http://qnap.com/useng/index.php?lang=en-us&sn=862&c=355&sc=3133&t=3134&n=22123&g=0). There are quite a few differences between the QGenie QG-103N and the Corsair Voyage Air NAS. Although both of these NASs have a compact mobile design, the Corsair’s battery runs at 6200mAh compared to the QGenie which runs at 3000mAh. While the Voyage has a battery life of 7 hours, the QGenie offers a full 10 hours of use before recharging is necessary. Both of these mobile NAS devices use USB 3.0 and offer a custom mobile app for both iOS and Android users. The Corsair Voyage Air is significantly larger than the QGenie, measuring 5.5” long and 3.3” wide. Similar to the QNAP QGenie, the Voyage Air allows users to access files from a variety of mobile devices, including smartphones, smart TVs, Blu-Ray players, DVRs, and certain video game consoles. The Voyage can be connected to a router via Ethernet to operate as an NAS, providing users with many of the same conveniences and features as the QGenie. The Voyage Air supports a multitude of connections and allows file sharing for up to 5 different devices while the QGenie allows for up to 8 users at once. The Voyage comes with a 1TB hard drive while the QGenie comes with a 32GB SSD. The fact that the Voyage uses a traditional hard drive versus an SSD means that its read and write speeds most likely will not be as fast though. Those who want to get as much speed as possible out of their NAS may want to consider opting for the QGenie, as it offers less space but faster read and write speeds. Because of the fact that there is no dedicated application for using the features of this device, it can be a bit tricky for some people. Who can benefit from the QGenie 7-in-1 Mobile NAS? Anyone who travels a lot, whether it is work or vacation, will find that this mobile NAS is a great investment to make. The ability to wirelessly access a variety of files from a tablet or mobile phone can be extremely convenient. 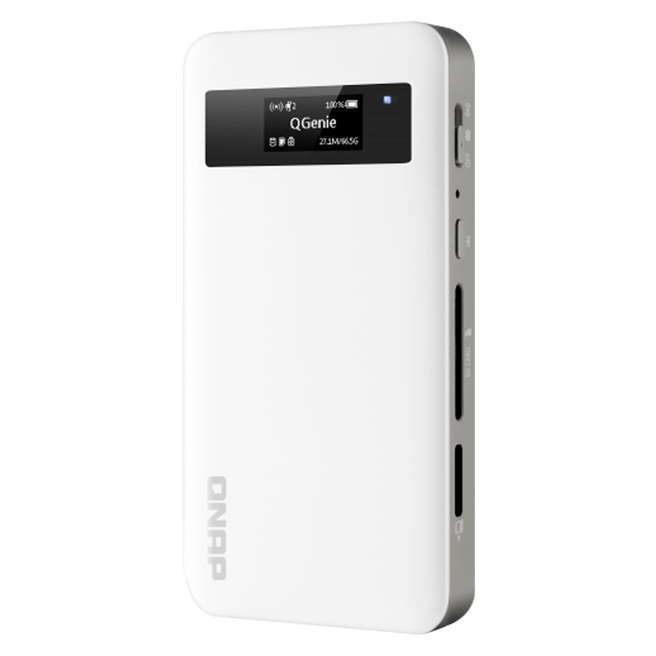 Those who frequently need additional storage space when they are away from a computer, such as a professional photographer, will also find this device to be of great use. Even those who are just relaxing at home will find that having this wireless server can be a great thing when it comes to watching videos, listening to music, or accessing any other type of file that is stored. The QGenie 7-in-1 mobile NAS is a great device that offers portability and convenience as well as all of the features of a wireless server for those who need additional storage on-the-go. Although this particular mobile NAS may not be the fastest or offer the most storage space, it is still a good investment for many people. The QNAP QGenie allows for connections for up to 20 different users and simultaneous file access for 8 users, which is definitely something that not all of these devices offer. While the read and write speeds with this mobile NAS could definitely be faster, it is still fairly efficient and adequate for those who aren’t expecting it to be lightning fast. With a battery life of 10 hours and USB 3.0, this mobile NAS is definitely a purchase worth considering for those who have been looking for one. See more reviews and latest price from Amazon about QNAP QGenie QG-103N.